SortSite is a search engine optimization testing tool for any web site. One click is all it takes to analyze an entire site for search engine penalties, and check for best-practice search optimization. Google Webmaster Guidelines - check for hidden text, single-pixel links, links to bad neighborhoods, sneaky redirects, etc. 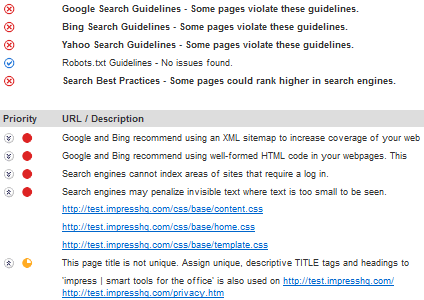 Bing/Live Webmaster Guidelines - check for keyword stuffed links and ALT tags, etc.